Spend 98% less time shredding, save time and money with Auto Feed shredders. This office shredder - ideal for up to 10 users - shreds up to 330 sheets (70gsm) or 300 sheets (80gsm) automatically in to approx. 400 4x40mm pieces each (P-4). With the Auto+ 300X shredder you do not need to stand and feed it, or even remove staples or paper clips first. It has an automatic feed and a 40 litre bin so you can load up to 330 A4 sheets and leave it to get on with the job. Stack, shut, done. Auto Feed means no more standing at the shredder. The Rexel Auto+ 300X shreds 300 sheets at the touch of a button, saving you over 8 minutes of your time versus traditional shredders. Shreds paper into cross-cut pieces for extra peace of mind (P-4 security level). Suitable for disposing of business documents containing proprietary information and/or sensitive personal information. A secure 4-digit PIN lock means that you can leave the Rexel Auto+ 300X to shred your documents in complete peace of mind. The built-in manual feed slot can handle up to 8 sheets, making it perfect for quick jobs that don't require the Auto Feed feature. The handy casters allow for quick and easy transportation around the office between users if needed. 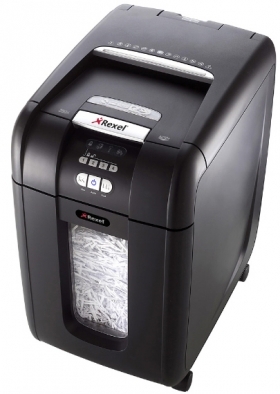 The Rexel Auto+ 300X can securely shred CDs and credit cards, meaning that you can use this shredder to look after all your data security requirements. CDs and credit cards are shredded into a separate bin, meaning that you can be certain that hard plastic pieces do not end up in your shredded paper bin. The product features a large, easy to empty bin with a capacity of 40 litres - enough to hold up to 450 sheets. Includes a viewing window so you can see when the bin's ready to be emptied.